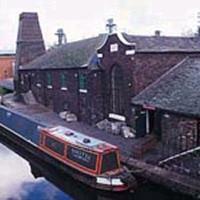 Situated at the junction between the Trent & Mersey Canal and the Cauldon Canal, Etruria Industrial Museum is centered around Jesse Shirley's Bone & Flint Mill. Built in 1857, the mill ground materials for the pottery and agricultural industries and continued operating the same processes until 1972. Visitors can explore the mill, which retains the historic machinery, and on selected 'steam' weekends and see the mill's steam engine, 'Princess', in action. The site also houses a modern visitor centre with a shop and tea room; serving drinks, snacks and ice creams. Visitors can also observe the comings and goings of canal boats as they navigate Etruria Locks. By road: From the M6 follow the A500 and take the A5006 towards the City Centre, then follow the signs for Etruria Industrial Museum. There is plenty of free parking. By bus: There are frequent bus services to Etruria from the City Centre. By rail: Stoke-on-Trent station is around 30 minutes walk from the museum.